This moth does best in warm climates, and while it is present year-round in the southern U.S. it does not appear to survive winters in the northern regions, migrating northward during the spring and summer only. The final larva instar buries itself in the soil to pupate and in warm weather adult moths will emerge within 1 to 2 weeks. They mate and the female begins laying eggs within a few days, depositing the eggs in small clusters of up to 16 eggs, gluing them in rows on foliage. A single female is capable of producing hundreds of eggs. 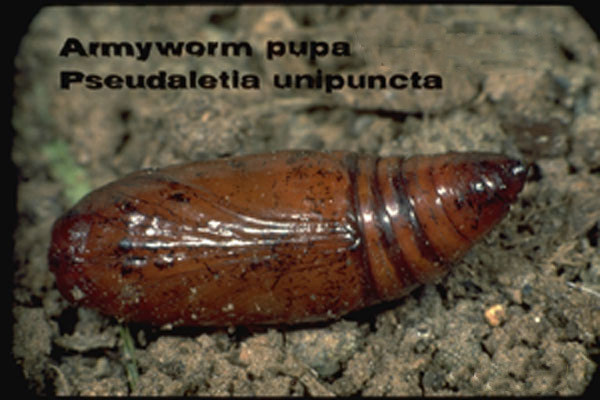 In summer months the larva completes development in about 3 weeks, and in cooler months may require 4 weeks or longer. There will be 2-3 generations each year in cool regions and up to 6 generations in southern states. 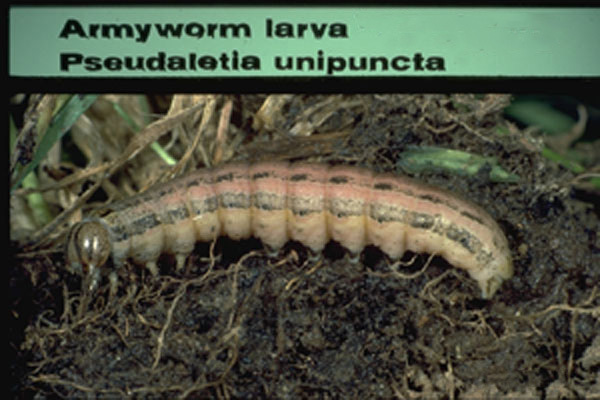 The preferred foods of the larvae will be grasses, including turf and grains – sugar cane, wheat, barley, oats, weed grasses, rice, rye, and many turf varieties. However, they also will feed on a great variety of broadleaf plants including many agricultural crops and ornamental plants. The adult moth has a wing span of about 4 cm, with the forewings elongate and pointed at the tips. The FW is tan to reddish-brown with some of the veins highlighted with white scales. The hind wing is a grayish brown. 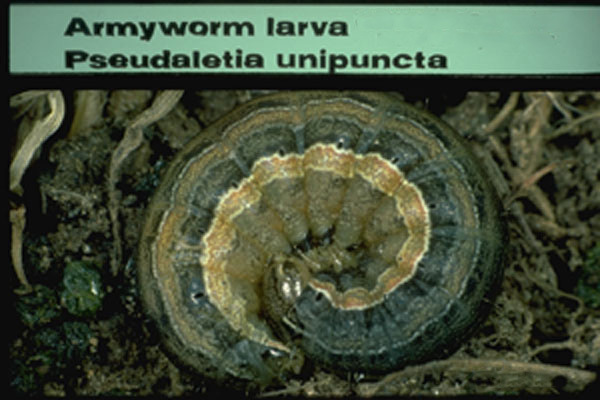 The full grown larva will be about 35 mm long with a dark grayish-green body color and with dark stripes running along the top and each side of the body. Below and between the dark stripes on the sides there will be a lighter stripe and the head capsule is a yellowish-brown color with darker veining. 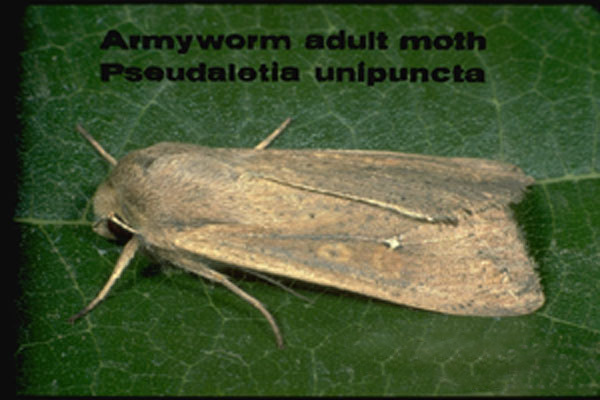 Elimination of weed grasses will help to minimize the presence of these moths around landscapes, and tillage of the soil can discourage them and expose the larvae and pupae to predators. 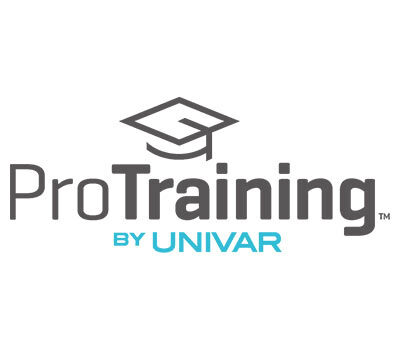 Residual insecticides are effective when applied to the plants that the larvae are feeding on.